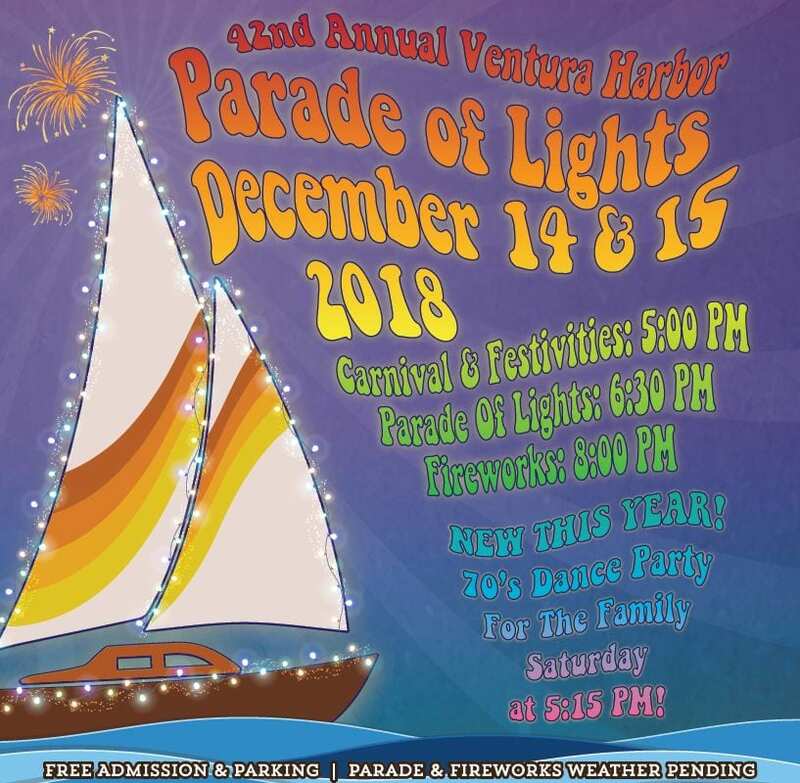 Ventura Harbor celebrates the season with its 42nd Annual Holiday Parade of Lights & Fireworks! The 2018 theme pays homage to all things 70’s. 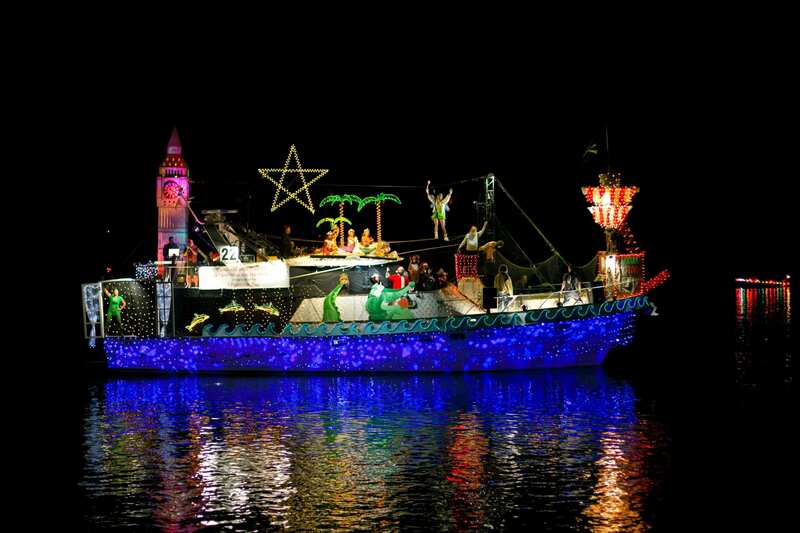 We are looking forward to a very colorful Boat Parade and Harbor Village festivities! 70’s attire encouraged! Soak up some holiday cheer at the Ventura Harbor Village with shimmering lights, whirling kid carnival rides, boutique gift shopping, delicious dining, and more! We’ll see you there! Parade of Lights judges do not confer on the winners. Winners are based on a tabulation of the points received by each judge in the first round of boats. Judges only vote once in the first round near the Ventura Port District /Harbor Patrol offices. Winners are announced at the Boater’s Brunch on the Sunday following the Parade of Lights. People’s Choice Award is open ONLY to those boaters that participate in the Friday night parade as the photos are taken then to post to Facebook. The People’s Choice Award is open on Saturday ONLY and closes about 30 minutes after the Parade has ended. It’s an online contest, in which the most votes received wins. First night of the boat parade! Dine seaside and take a harbor cruise to see the lights or relax on the promenade with a hot cocoa to watch the twinkly boats. 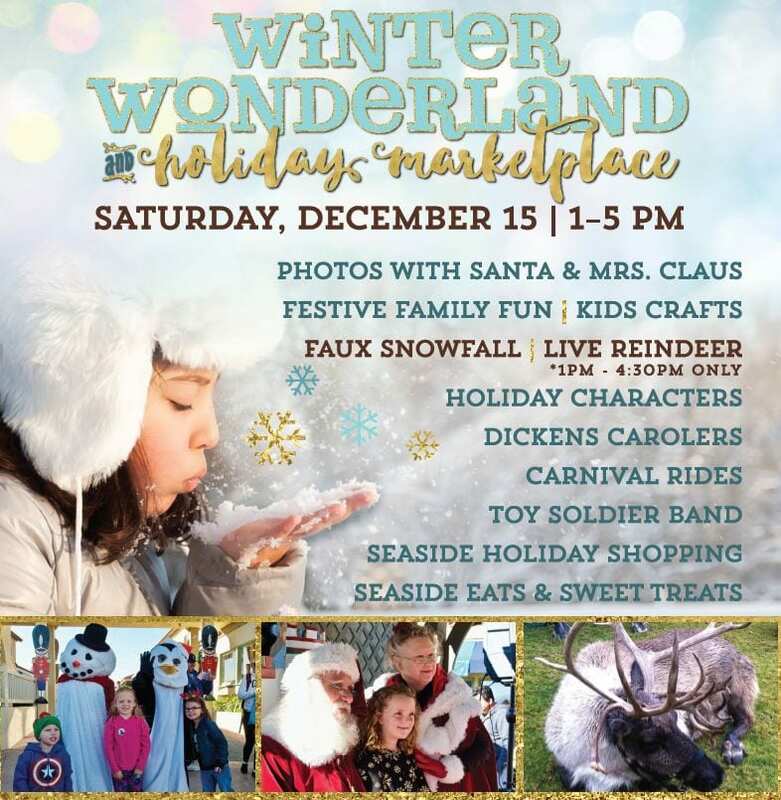 Arrive early to partake in Ventura Harbor Village’s Winter Wonderland & Holiday Marketplace with festive carolers, photos with Santa & Mrs. Claus, live reindeer, holiday characters, faux snowfall, holiday gift shopping, European Christmas Marketplace with artisans, and more! Departures: There are 2 departures on Friday at 6:20pm & 6:40pm and 3 departures on Saturday at 6pm, 6:20pm, & 6:40pm. Cost: $35 for adults, $32 for seniors (55+) and $25 per child (12 & under). Approximate 1.5-2 hour cruise. Departures: There are two departure times at 5:30pm & 7:30pm. Cost: $35/Credit Card or $31.50/Cash Per Person. Approximate 1.5 hour cruise. Book: Visit VenturaBoatRentals.com or call (805) 642-7753 to reserve. Parking & Event are FREE! Ride the Downtown – Harbor Trolley to the event. Please NOTE: Parking for the parade and for large vehicles will no longer be available on the dirt lot on Schooner & Navigator Road due to Portside Ventura Harbor development in progress. Love Local – Shop & Dine Local!